Can medical ethics be “neutral”? Can medical research be of value to society unless it is ethical? This poser is put by an editorial in this first issue of IJME in 2018. Another examines the lacunae in the Medical Council of India’s criteria for appointing medical teachers in its 2017 circular. As the journal enters its 26th year of publication, we are living through a tumultuous period in history. How should a journal of bioethics deal with the challenges? Should it simply focus on the doctor-patient relationship and “neutral” medical science? Can these ever be “neutral”, divorced from social and political factors? Two authors discuss the question and conclude that doctors must speak out against the abuses of human rights to be true to their profession. 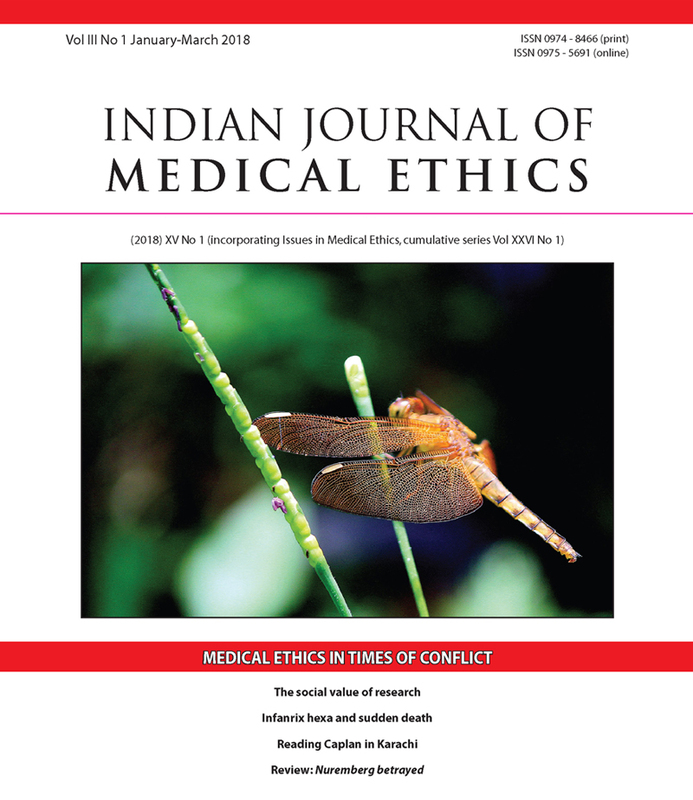 This issue contains research findings on whether the teaching of humanities and ethics can be enjoyable; on whether patients and their relatives have clear perspectives on participation in clinical trials; and how altruism in medical students gradually withers in the course of their medical studies unless a nurturing environment for such values is created. With ethics being an evolving discipline, a comment looks at a historical case of completely unethical treatment for the greater glory of the concerned surgeon, and another critically examines a recent decision on the ethics of controlled human infection of healthy volunteers for vaccine development. An author analyses with cautious optimism the new HIV Act, which was based on a consultative foundation. The issue is packed with stimulating articles on end of life care, AYUSH, and vaccination policies, reviews, letters and a story—none of them in the least neutral! We would also like to wish our readers and contributors a wonderful 2018, and thank them for their steadfast support through the past 25 years. Reviewer's rejoinder: Who will take responsibility?